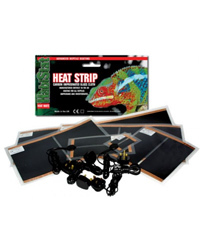 Habistat heat Strips are manufactured in the same way as mats. They are made narrower and are generally used to heat small boxes and the cages used for housing juvenile snakes and some other species, or for heating racking. The principles of use are the same as those for mats and the same precautions should be exercised. In small enclosures the heat build up can be very quick. The temperature should be adequately monitored and controlled with a HabiStat thermostat.